Coming into tonight’s game, the Marlies were looking for redemption after dropping a 5-0 decision to the Checkers on home ice when they last met on January 6th. 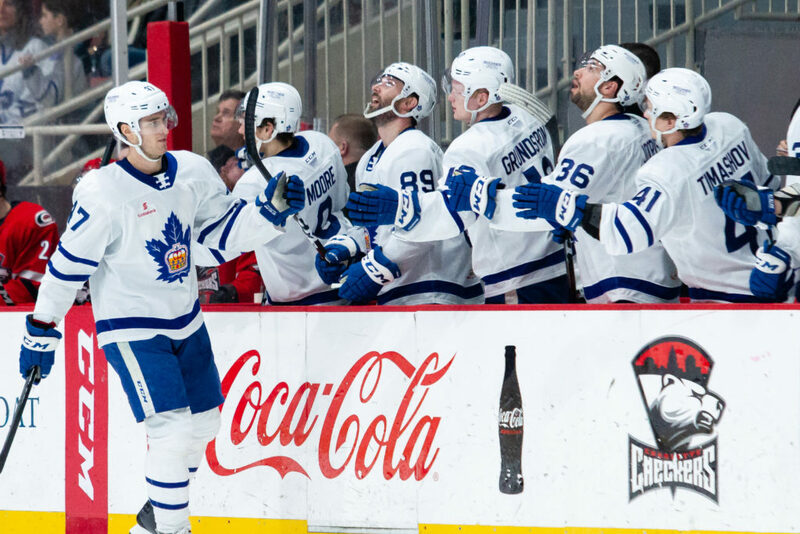 The Marlies jumped out to a 2-0 lead in the opening frame and were able to preserve a lead for the majority of the game until the Checkers evened things up to force overtime. Mason Marchment provided the overtime heroics with a huge individual effort to seal a 4-3 win for the Marlies. Pierre Engvall opened the scoring at 9:28 beating Checkers’ goaltender, Callum Booth with a tip in front of the net. Jordan Subban and Jeremy Bracco assisted on Engvall’s 10thof the season. At 15:27 the Marlies converted on the power play as Jeremy Bracco fired a shot from the faceoff dot past Booth to make it 2-0. Calle Rosen and Chris Mueller assisted on Bracco’s ninth of the season. The Marlies outshot the Checkers 11-10 in the opening 20 minutes and held a 2-0 lead on the scoresheet heading into the second period. The Marlies picked up where they left off as they generated lots of close chances in the opening minutes of the frame. Charlotte’s Nick Schilkey got the home team on the board at 2:19 with an unassisted goal. Late in the frame, Rosen restored the Marlies two-goal lead, burying his own rebound for his fifth of the season. The Checkers added two goals in the third from Jake Bean at 4:22 and Patrick Brown at 6:39 to even the score 3-3. The score remained tied at the end of regulation resulting in three-on-three sudden death overtime. Both teams exchanged chances in the early seconds of extra time. Two minutes into overtime, the Checkers were on the attack when Marchment poked away a drop pass and jumped out on a breakaway where he made no mistake beating Booth to seal a 4-3 win for the Marlies. The Marlies and Checkers will be back at it again tomorrow for a 1 PM puck drop on AHLTV. Heading into tonight’s game, the Checkers are riding a three-game winning streak after picking up a 6-4 win over Bridgeport on Wednesday. They are 7-2-1-0 in their last ten and continue to sit atop the league standings. While the Marlies dipped to below .500 at home (9-10-2-0) after Saturday’s loss, they’ve continued to have a strong showing on the road (10-5-1-2). They have the league’s second-best road power play (29.1%) and are second in goals for on the road with 84. Special teams situations will definitely be a key area to watch in tonight’s matchup.